As part of the Decade of Centenaries, the Commonwealth War Graves Commission, with the support of the Irish Government, have commissioned Commemorative Stones for all 24 recipients of the Victoria Cross during the First World War who were born in the Republic of Ireland. The memorial programme associated with the Commemorative Stones includes a commemoration taking place on the anniversary of the historic action for which each Victory Cross was awarded. In conjunction with the Glasnevin Trust, the 24 Commemorative Stones will eventually be part of a unified permanent display at the Cross of Sacrifice in Glasnevin Cemetery, Dublin. On Friday, 11 November, in association with the Armistice Commemorations, and after the Wreath Laying Ceremony, Commemorative Stones were unveiled in Glasnevin Cemetery, in honour of four Irish men who received the Victoria Cross for their bravery in the First World War: Lieutenant John Vincent Holland VC, Sergeant Martin O’Mara VC, Private Thomas Hughes VC and Corporal Frederick Edwards VC. Speaking at the event, Minister for Public Expenditure Paschal Donohoe TD said he was honoured to have the opportunity to take part in the Armistice Day commemorations. The Military Heritage of Ireland Trust CLG was represented at the ceremony by its Chairman, Brigadier-General Paul Pakenham (Retd). Born in Model Farm, Athy, County Kildare on 19 July 1889, John Holland was educated in Clongowes Wood College and Liverpool University. Enlisting in the Life Guards, in 1915 on attachment to the 2nd Battalion Royal Dublin Fusliers he deployed to France. 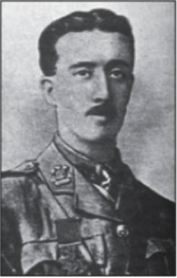 Wounded in August 1915, he returned to Ireland to Ireland to convalesce, and later returned to France with the 7th Battalion Royal Dublin Fusiliers. He was promoted to Captain, Mentioned in Dispatches and was awarded the Hickie Parchment for bravery. Discharged In 1918, Captain Holland re-enlisted with the 9th Lancers of the Indian Army in November 1919 and was promoted to Major. He also served with the 9/10th Duke of Cambridge’s Own Lancers (Hodson’s Horse) during the Second World War. 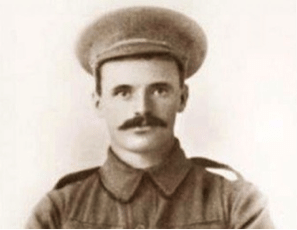 Born on 06 November 1885 in Terryglass, Lorrha, County Tipperary, Martin O’Meara emigrated to Australia and enlisted in the Australian Imperial Force Perth on 19 August 1915 in the 16th Battalion. Following training in Egypt, the unit deployed to the Western Front. During the period 09 to 12 August, the unit was engaged at Mouquet Farm near Pozières. Sergeant O’Mara was credited with having saved the lives of a considerable number of his colleagues and was involved in resupply of rations and ammunition. For this action, he was awarded the Victoria Cross and was presented with his medal by King George V at Buckingham Palace on 21 July 1917. Sergeant O’Meara was later wounded on three occasions, and his experiences led to a complete breakdown in his health. He spent the rest of his life in hospital, and died in Perth in 1935. He was buried with full military honours. Thomas Hughes was born in Corravoo, Castleblayney, County Monaghan. Private Hughes received his Victoria Cross at an investiture from King George V in Hyde Park on 2 June 1917 for action during the Battle of the Somme at Guillemount, France, on 3 September 1916. Private Hughes also received the 1914-15 Star, British War Medal and Allied Victory Medal. Subsequently, he was promoted to Corporal. Corporal Hughes is buried in Broomfield, County Monaghan. Born in Cobh, County Cork, Frederic Edwards enlisted in 1915 in B Company, the 12th Battalion, The Middlesex Regiment. Subsequently, he was promoted Corporal and died, at the age of 69, on 09 March 1964 at the Royal Star and Garter Home in Richmond, London. He is buried in East Sheen and Richmond Cemetery, London and his Victoria Cross is displayed at the National Army Museum, Royal Hospital Road, Chelsea, England.